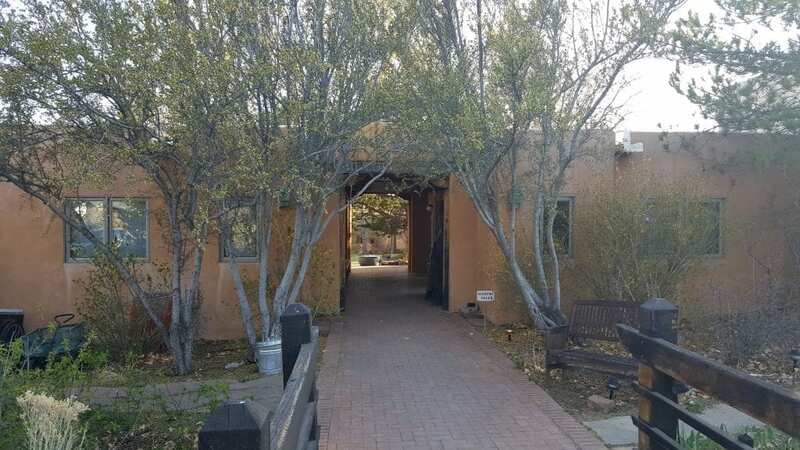 I arrived right in the middle of one of their community meetings, but luckily I caught them during a break to make introductions and get the keys to one of the guest rooms. 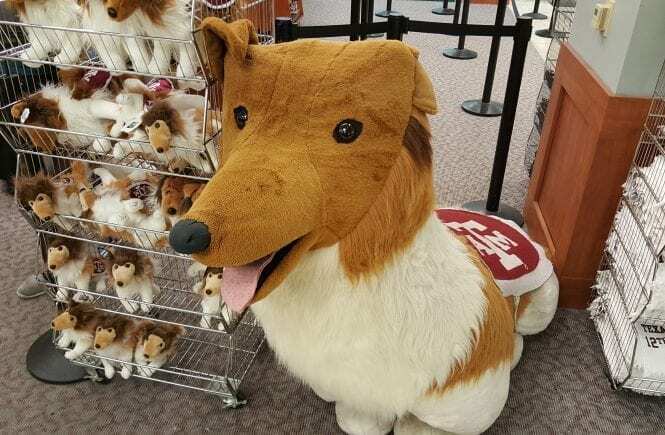 I didn’t want to be a bother on their meeting, and felt like I had an awkward interaction with one of the residents – so I decided to leave the meeting and get settled in. 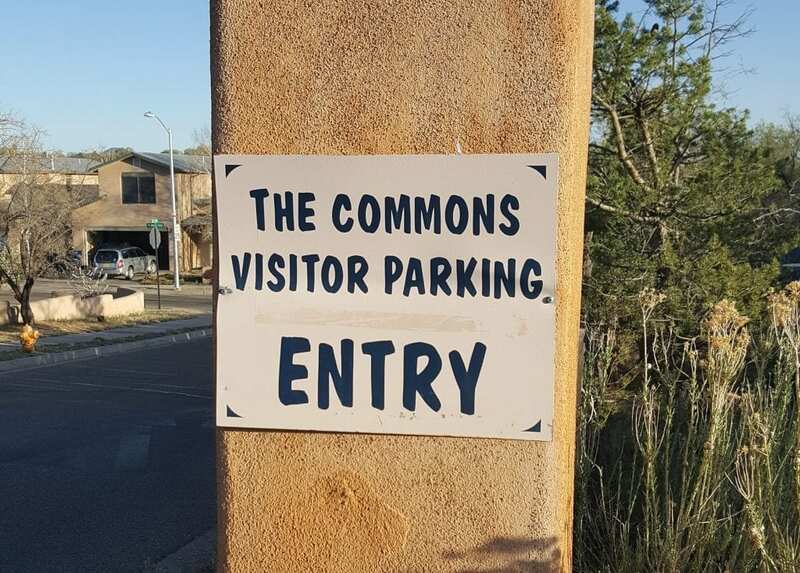 This is a view of the Commons’ parking lot, which backs up to the main entrance to the community. 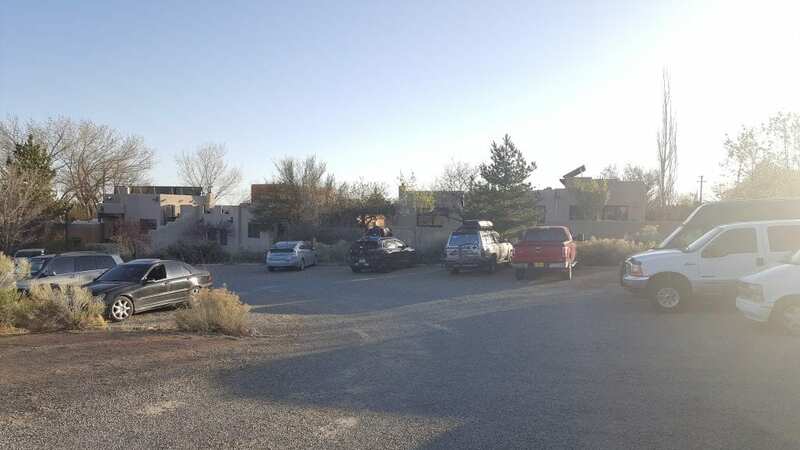 Between the parking lot and the edge of the community is a dried up creek bed that fills up during monsoon season. 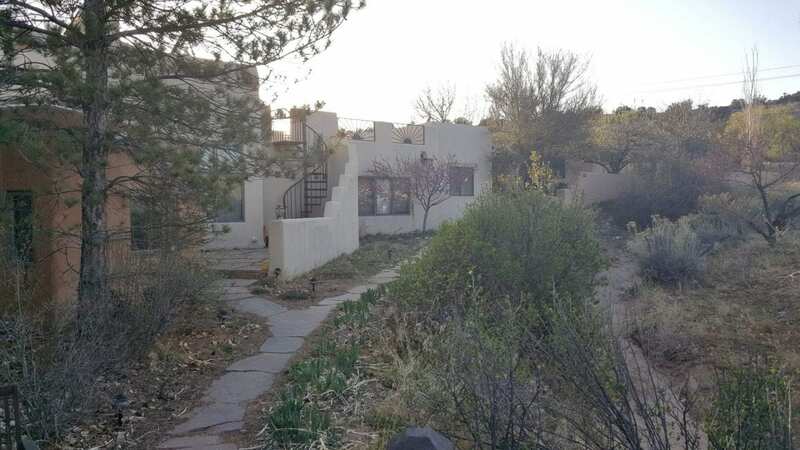 Crossing the bridge over the dried up creek bed is the entrance to the community. 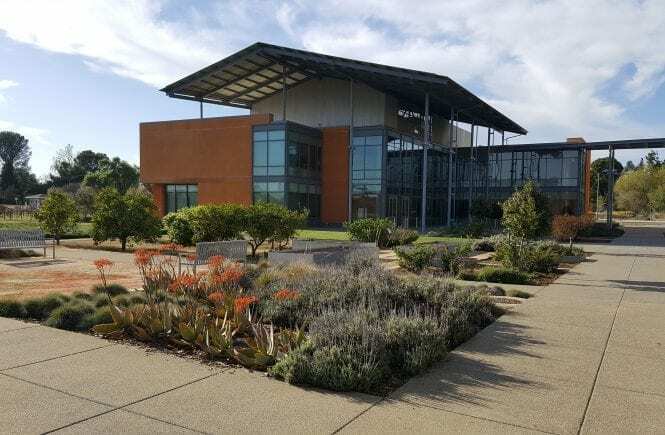 Immediately to the left is the community center – with a kitchen, meeting hall, library, workout facility and several other multi-purpose rooms. On the right are the three community guest rooms for friends and family. 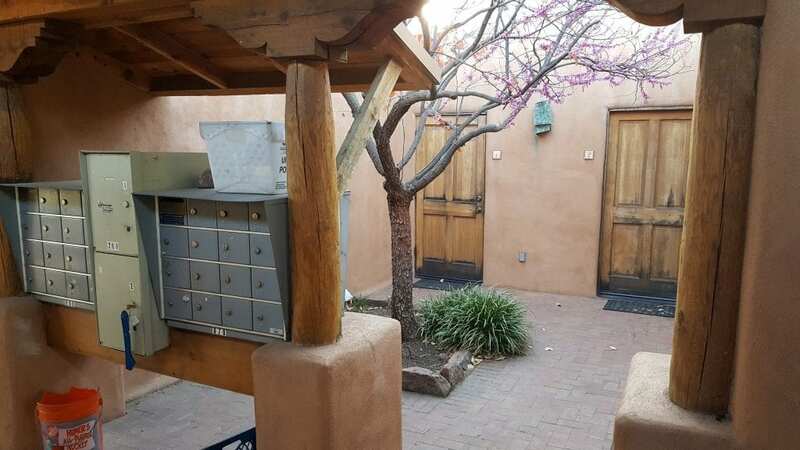 A view of the community guest rooms and mailboxes, with a beautiful purple blossoming tree in the small courtyard. 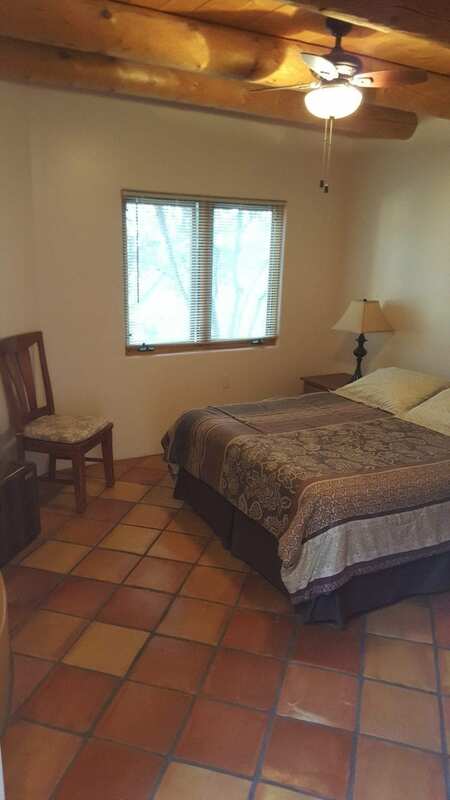 This is the adobe architectural style guest room I stayed in, which was very spacious and had a large fireplace in the corner of the room! Like many communities I stayed in, there were certain rules to follow. 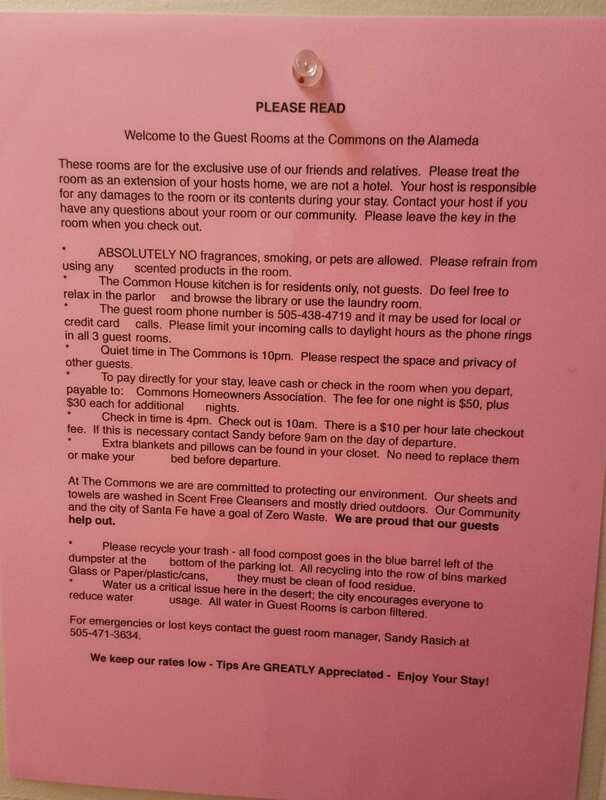 However, what set the Commons apart from other communities is their “fragrance-free” environment. While I can respect that some people have allergies or are sensitive to chemical/artificial fragrances – its not something I adhere to because I like to use soaps and cleaners that make me smell good – just a personal preference! 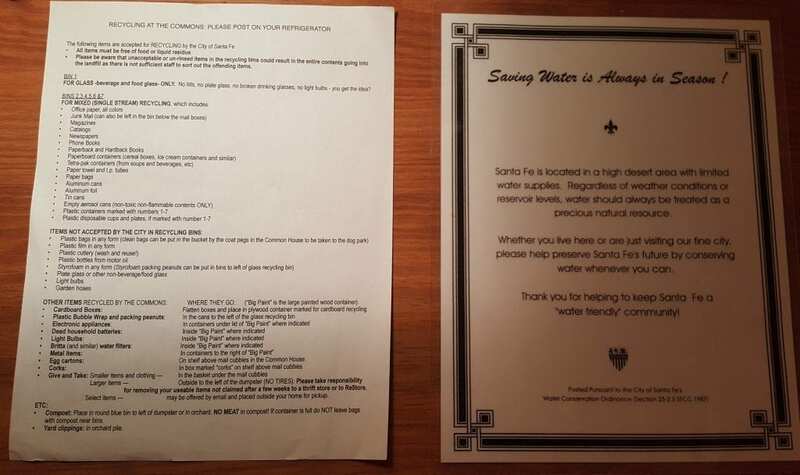 In addition to the rules, there were some flyers on the dresser that explained the onsite recycling program – detailing specific recyclables, as well as a reminder to save water because of its general scarcity in the area and seasonal droughts. 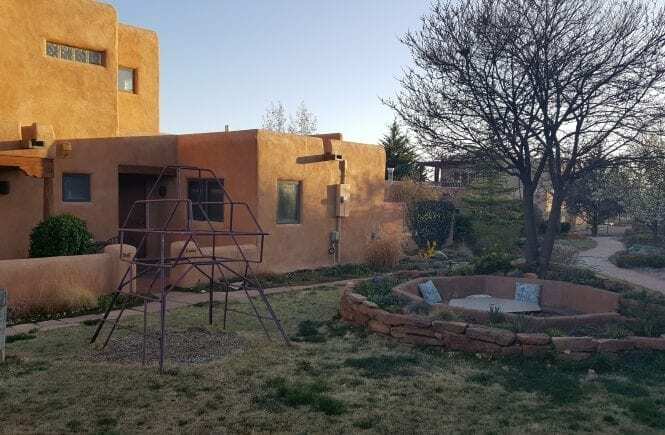 After I unloaded my bags from the car, I took advantage of the remaining daylight and walked around the grounds taking pictures of the placitas, rainwater harvesting systems and the landscapes and gardens. 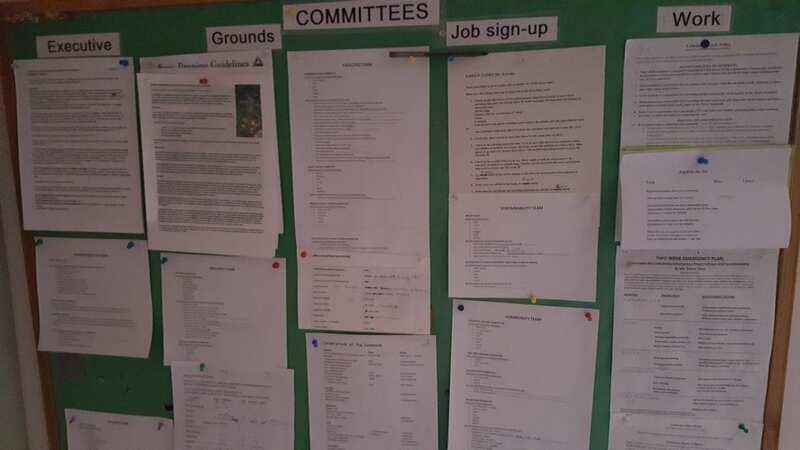 In the community center, there were several walls with flyers and sheets, like this ‘committees board,’ which had updates from committees as well as opportunities for job sign-ups and other work in the community. 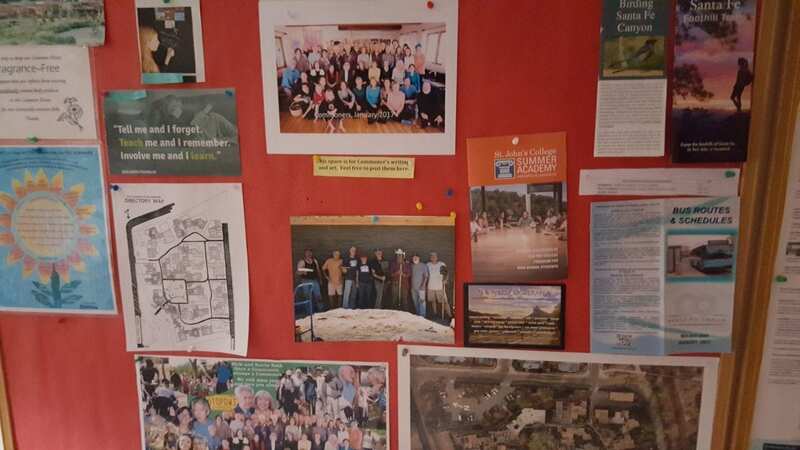 This board featured local activities, like classes and tours, as well as local information like bus routes, a map of the community, fragrance-free reminders and group photos! 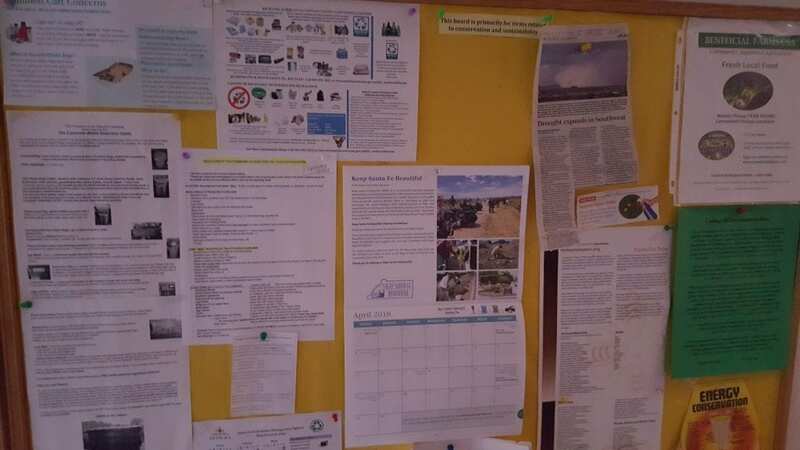 The ‘conservation and sustainability’ board featured guidelines for recycling and attracting pollinators, local clean-up initiatives, news articles and calendars with ecological events in the area. I found this community flyer to very comprehensive of what the community as a whole expects in its residents, and gives prospective members a feel of what it takes to be a successful, contributing member. 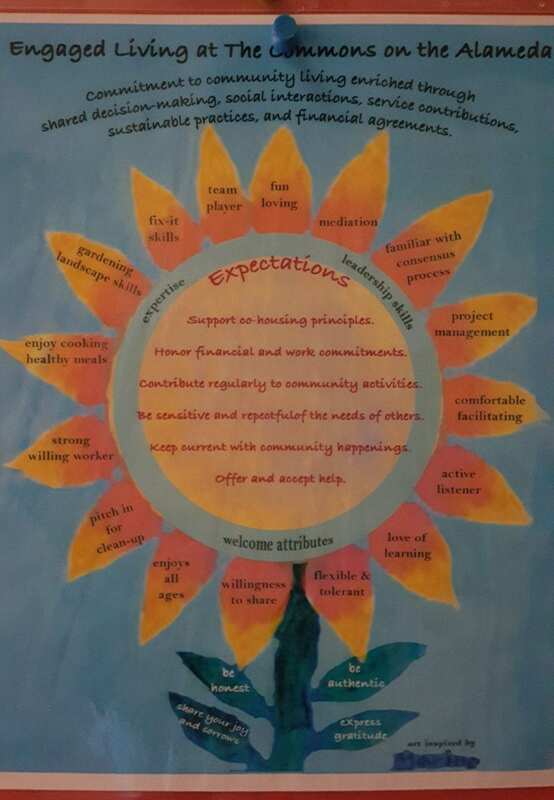 I can also say that this artistic diagram could be applied to all communities that strive to have healthy environments and attract contributing residents! 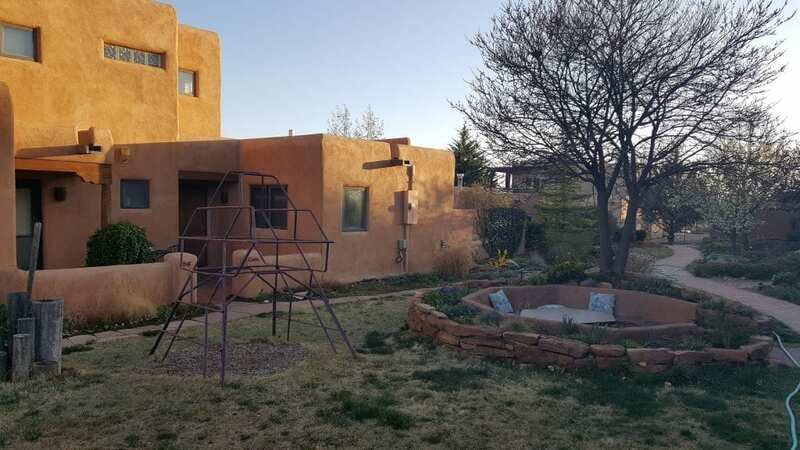 Here’s a view from inside the Commons community, showing an open courtyard with a sunken sitting space next to a small child’s play gym, all nestled between the adobe-style residences in a beautifully maintained native landscape. 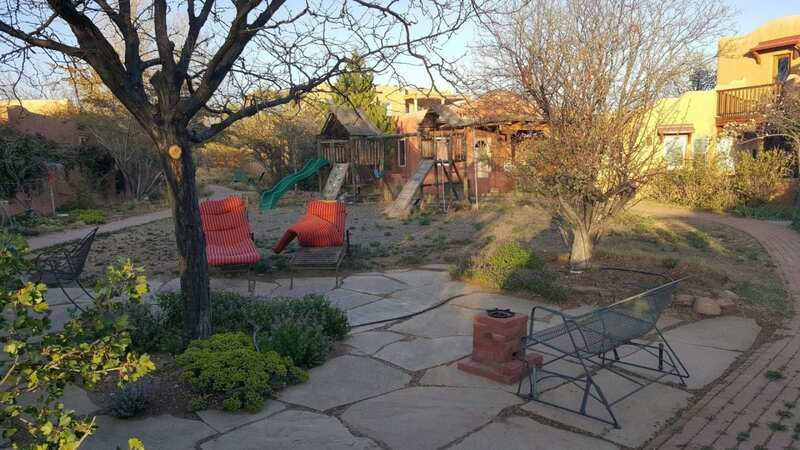 The open-space courtyard with a sitting area and playground design was repeated a few times around the community. 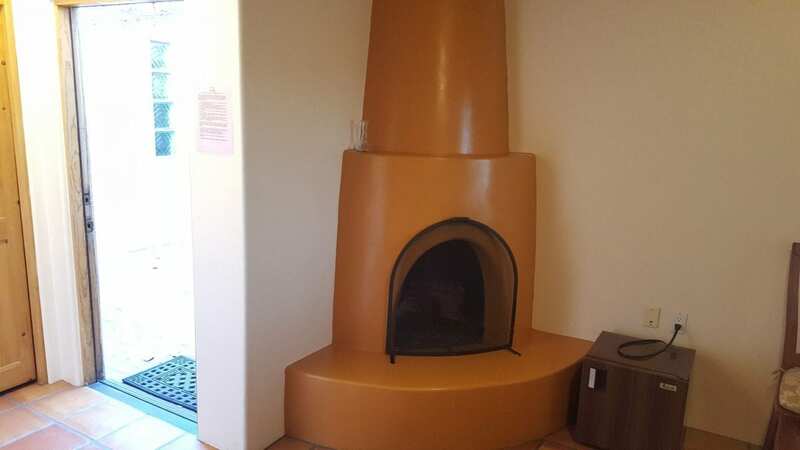 There was also a hand-made brick oven built by a glider bench in this courtyard. My hostess later told me that the playgrounds were rarely used because the community has an aging population issue. 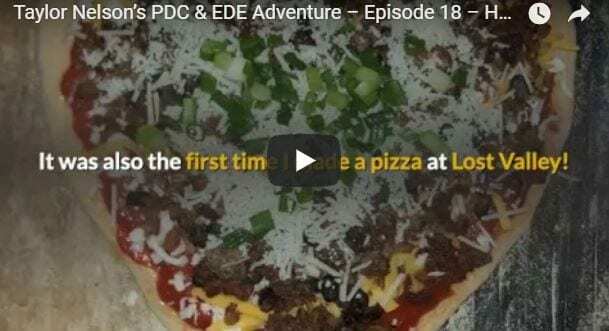 So it’s becoming less multi-generational compared to when it was established, and is evolving into a senior cohousing community – a direction most of the residents are not happy about. In the far back corner of the Commons are the community gardens, also with plenty of seating and a small play gym for children. 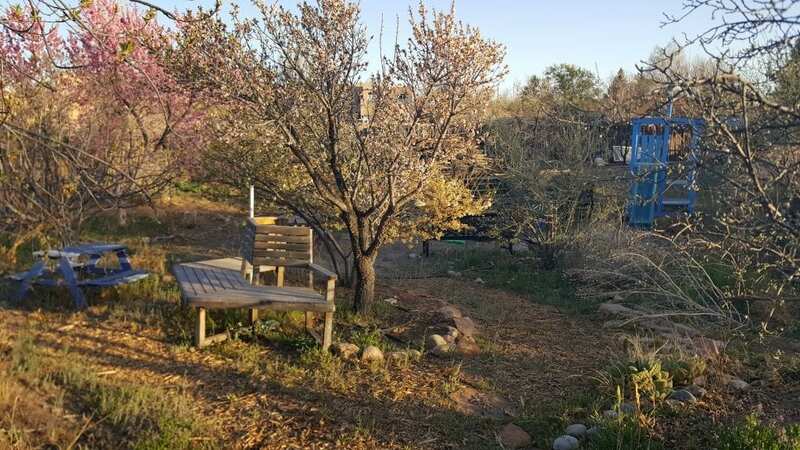 These gardens do not produce a significant percentage of food, so they are primarily for aesthetics and give residents an activity to do instead of serving as communal food production. 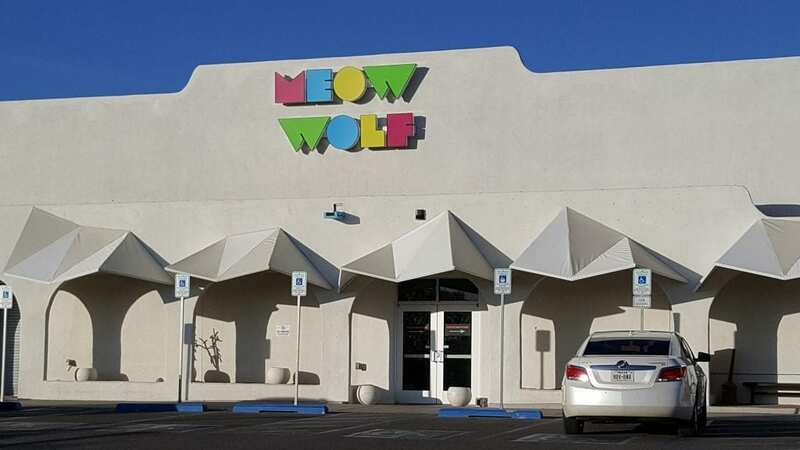 I went to eat out that night, and came across Meow Wolf, an permanent interactive art exhibit not far from the community. It was about to close for the night, so I made sure to add it as a stop for the next day.